And there’s a great opportunity on it. 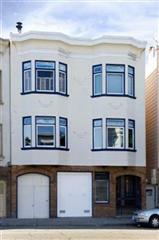 640 Guerrero is a lower unit flat in this two unit building at Guerrero and 18th St; trendy Mission Dolores! Edwardian era with great detail including a bungalow fireplace. 2 bedrooms, split bath and 2 car parking-with it’s own garage door and entrance. Listed at $875,000. Given the location, market and level of finish (which still has room for your creativity), I would say the property was overpriced. But. there’s a great bonus. A deeded carriage house belongs to this unit. That totally makes it worth it. Carriage house goes with the unit-what possibilities! Fantastic location-convenient to public transit, Dolores Park, the Mission, Noe Valley, the Castro, Bi-Rite and many wonderful stores and restaurants. Available to be shown by appointment.